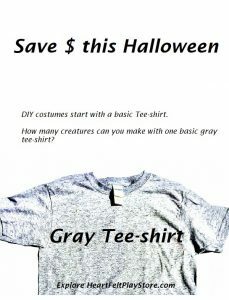 Before the Halloween Pop Up Shops open their doors in town to lure you in to horrifying prices let’s think about how to save money this years by making a DIY Halloween costume with your child. 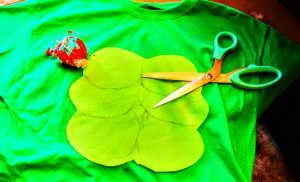 I will list of my own ideas then share with you a list of craft supplies, trims and pieces parts to embellish your DIY costume along with your creativity. 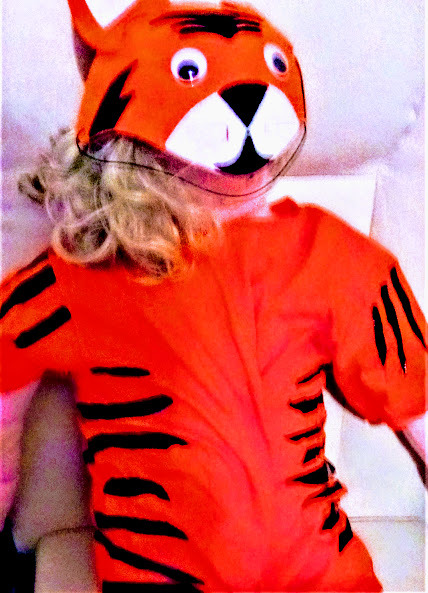 Just for fun sit down with your child to make a list of ideas that they would like to dress up as for Halloween…yes I know they just went Back to School, but, this will be a fun conversation that will last for weeks to come. Apple green tee-shirt make the perfect base for a money saving Halloween costume. 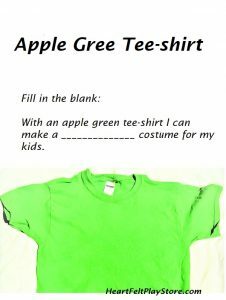 Can you help me by listing you ideas for a Halloween costume using an apple green Tee-shirt? 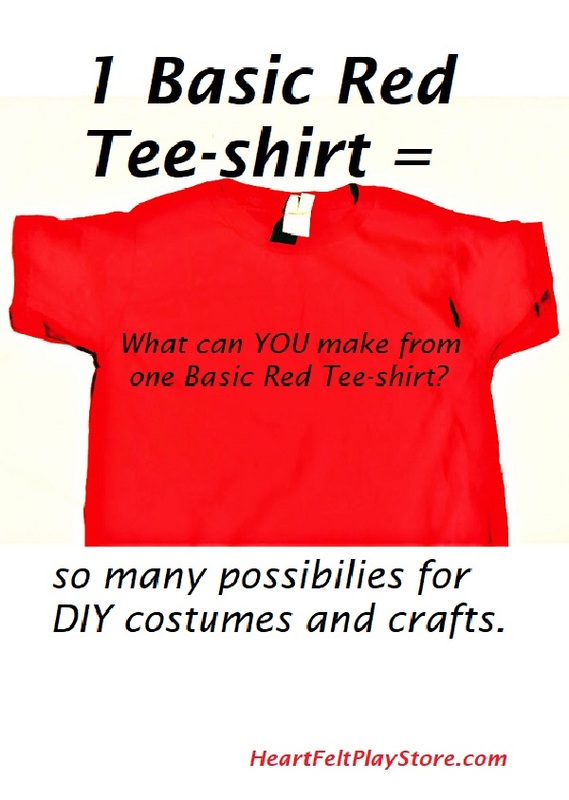 One Basic Red Tee-shirt = so many costume possibilities. 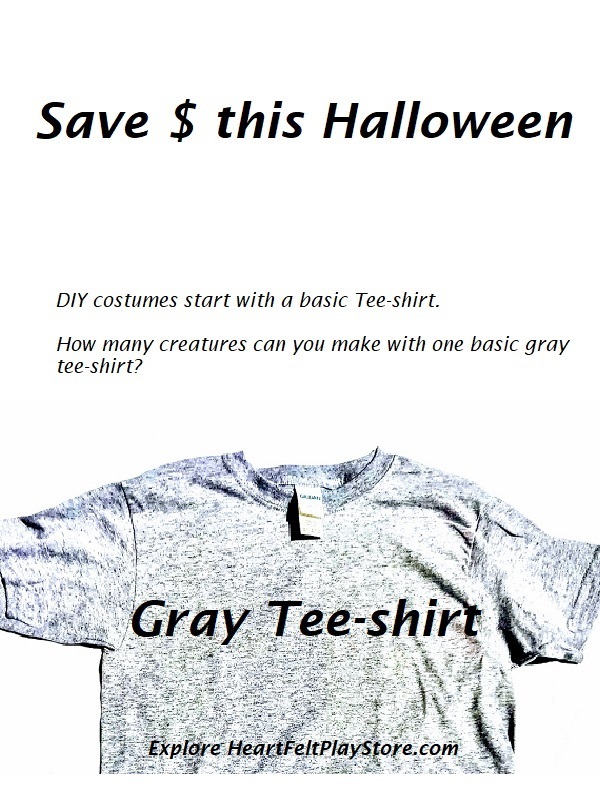 DIY Halloween costumes save money and is a fun family activity. 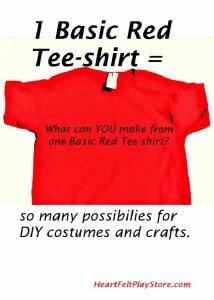 How many ideas can you name that a RED Tee-shirt is needed for a costume?. DIY your kids Halloween costumes starting with a basic black tee-shirt. 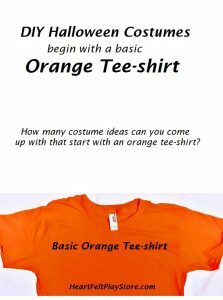 How many ideas can you add to my list of tee-shirt basic Halloween costumes ideas? 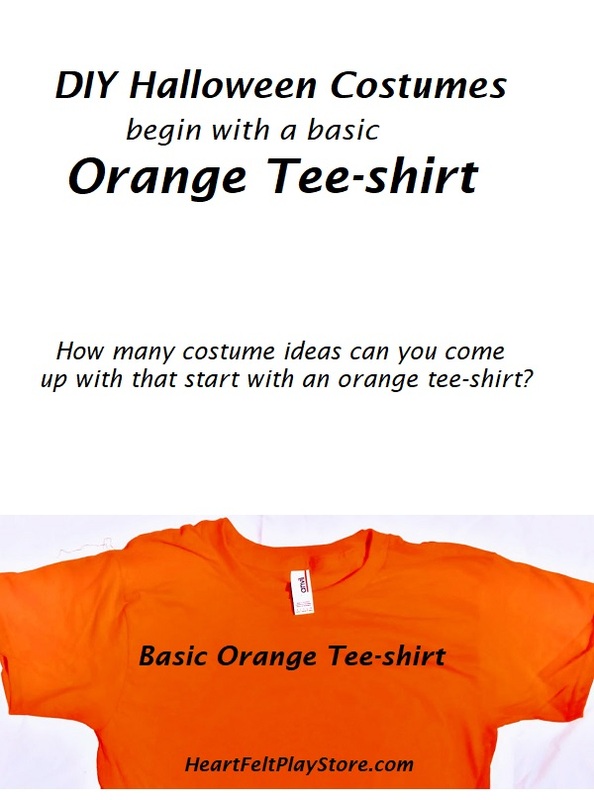 Pumpkin Orange Tee-shirt is a must when Halloween is in the air. 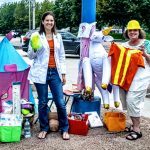 I am always open to ideas that kids come up with themselves. Feel free to post your kids’ ideas on my Facebook page. 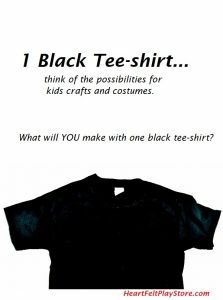 Click HERE to follow @HeartFeltPlayStore on Facebook and share you ideas for cheap tee-shirt costumes. 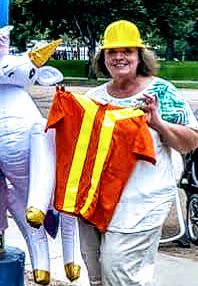 Who wants a Discount Code to Use for Heart Felt Play Store Costume Pieces parts? Go to HeartFeltPlayStore.com front page. Do you see the scrolling banner? Wait for it…there will see the most up-to-date DISCOUNT CODE for a limited time. Also check our Heart Felt Play Store page on Facebook. The banner at the top will also show a current DISCOUNT CODE or Special. Like the page and I will acknowledge you LIKE and offer you a one time Special offer. Pm me if I do not respond in 24 hours with your special code.